Aquarium snails are interesting shellfish that provide a natural and effective means of cleaning your aquarium. Snails eat decomposing plants and algae that would otherwise foul the water and kill fish. They're easy to care for -- in fact, without an attentive eye, an aquarium can become overrun with them. Freshwater aquarium snails thrive in water between 18 and 28 degrees Celsius. They prefer hard, alkaline water -- a fancy way of saying water with a lot of dissolved minerals. Snails use dissolved minerals to build their shells. 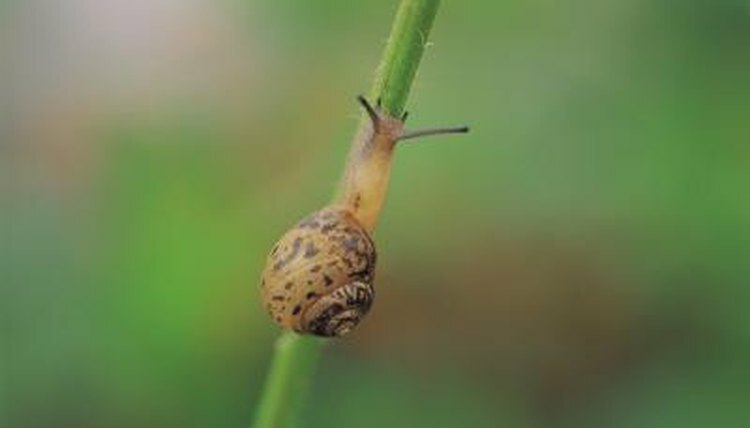 Don’t worry about the hardness; snails are very hardy and can live in a wide range of conditions. If the water isn’t hard, the only consequence is that they won’t reproduce as often -- and that is often considered a benefit. Snails scavenge the aquarium for rotting plants and food. Overfeeding your fish creates an overabundance of nutrients, which fall to the bottom of the tank and become fair game for snails. The feast triggers breeding responses that can lead to population explosions. A group of snails can lay hundreds of thousands of eggs. So, only feed aquarium fish what they can eat in a few minutes; if you see a lot of food on the aquarium floor, it's a sign you're overfeeding. If the conditions are right, snails reproduce prodigiously. The brown ramshorn snail and pond snail are two species that can easily become pests rather than pets. They keep glass free of algae, but an entire colony of snails slithering across the aquarium is unsightly. Some snails can even climb out of the tank and live in the house for a time. Be sure to ask the aquarist at the pet shop to identify the species before taking them home. If it’s too late and the aquarium is already overpopulated, a great solution is to introduce predators, such as clown loaches -- they’re beautiful orange- and black-striped fish that naturally prey on snails. With time, a balance between the two species can be reached, making a win/win scenario. Another method of removing unwanted snails is to place a small piece of lettuce at the bottom of the aquarium, turn off the lights (aquarium snails are nocturnal) and wait a few hours. Lift the lettuce out with the snails attached and give them to your aquarium-owning friends or donate them back to your local pet shop. According to Ryan Wood, an expert on mollusks and a contributing writer for PlanetInverts.com, two great species of snails for the home aquarium are the Malaysian trumpet snail and horned nerite snail. The trumpet snail has a wonderfully intricate horn shape; it cleans detritus from the gravel and doesn’t feed on ornamental plants. The horned nerite keeps the glass algae-free and will not breed in freshwater. Their eggs require brackish (salty) water, which assures population control. Aquarticles.com: Snails Friend or Foe in the Aquarium? What Food Do Pet Snails Eat? What Kind of Fish Likes Elodea Plants?